LinkedIn’s vision is to create economic opportunity for every member of the global workforce. Facilitating economic empowerment is a big task that will require bold thinking by smart, passionate individuals and groups. Today, we’re kicking off an initiative that aims to encourage this type of big thinking: the LinkedIn Economic Graph Challenge. The LinkedIn Economic Graph Challenge is an idea that emerged from the development of the Economic Graph, a digital mapping of the global economy, comprised of a profile for every professional, company, job opportunity, the skills required to obtain those opportunities, every higher education organization, and all the professionally relevant knowledge associated with each of these entities. With these elements in place, we can connect talent with opportunity at massive scale. We are launching the LinkedIn Economic Graph Challenge to encourage researchers, academics, and data-driven thinkers to propose how they would use data from LinkedIn to solve some of the most challenging economic problems of our times. We invite anyone who is interested to submit your most innovative, ambitious ideas. In return, we will recognize the three strongest proposals for using data from LinkedIn to generate a positive impact on the global economy, and present the team and/or individual with a $25,000 (USD) research award and the resources to complete their proposed research, with the potential to have it published. The LinkedIn Economic Graph Challenge begins at 9:00am PST on October 14, 2014, and entries must be submitted by midnight PST on December 15 , 2014. Winning proposals will be selected in early 2015. A winning team or individual will receive a one-time $25,000 (USD) research award. Winners will also receive two trips to LinkedIn’s headquarters to participate in the LinkedIn Economic Graph Challenge Research Reception (early 2015) and Final Presentation (Fall 2015). With LinkedIn oversight and approvals, the winning team or individual may have the opportunity to work with data from LinkedIn to complete and potentially publish their research. 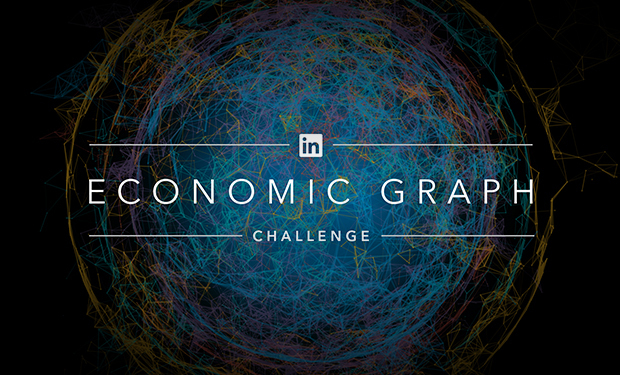 The LinkedIn Economic Graph Challenge is open to U.S. residents only. Find more details in our FAQs. The LinkedIn Economic Graph Challenge has been carefully planned with our member’s privacy and security in mind. All access to and usage of select data from LinkedIn will only be granted to the winning teams or individuals, and will be done so under the supervision of a LinkedIn employee collaborator. Additionally, all research award recipients will be required to undergo security training and work on LinkedIn issued laptops on the LinkedIn network within a monitored sandbox environment. Creating economic opportunity is not something we can do alone. As we continue to scale the Economic Graph, and work with others through initiatives like the LinkedIn Economic Graph Challenge, we can uncover insights to remove barriers to economic opportunity everywhere. We look forward to your submissions! For more information, please visit the LinkedIn Economic Graph Challenge website.